Professor Balbuena was a Starr Fellow at the Center for Jewish Studies at Harvard University before joining the Clark Honors College in 2004. In addition to her teaching in the honors college, she is a participating faculty in the Comparative Literature and Romance Languages departments. Professor Balbuena is also active with the Jewish Studies program, where she sits on the executive committee; the Latin American Studies program, for which she served as interim director in 2014-15; and the Women and Gender Studies program. She is a member of the Center for the Study of Women in Society's Women of Color Project, sits on the executive board for the Center for Latino/a and Latin American Studies, is chair of the Curriculum Committee in the University Senate, and is extremely active with the university's Global Studies Institute, where she participates in working groups on Brazil, Israel, and translation. Outside of the university, Balbuena sits on the editorial boards of The Journal of Jewish Identities, The Levantine Review, and The Journal for the Study of Sephardic and Mizrahi Jewry. She is editor of modern literature for The Encyclopedia of Jews in the Islamic World. Balbuena is fluent in Portuguese, English, French, Spanish, Hebrew, Ladino and Italian, and has functional knowledge in Arabic, Catalan, Galician, and Yiddish. Monique Balbuena is a translator and a scholar of comparative literature and Jewish studies. Her research interests concern the relationship between language and identity, specifically how multilingual writers construct their identity through their choice of languages and intertexts. She has focused on literatures from North Africa's Maghreb and Latin America, and also given special attention to literatures by Sephardic Jews - roughly defined as those whose origins are in the Iberian Peninsula of Spain - especially works written in Ladino, the Sephardic language. She is among a handful of scholars examining the production of contemporary literature, particularly poetry, in Ladino. Balbuena analyzes Ladino not only within the landscape of Jewish literature, but also within the context of how literature written in minor languages informs our reading of canonical works. Professor Balbuena is currently working on two book projects: Sephardic Literary Responses to the Holocaust, and Ladino Today: Cultural Representation, Language Revival and National Identity. 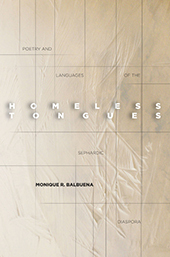 2016, Homeless Tongues: Poetry & Languages of the Sephardic Diaspora (Stanford University Press). 2012, "Jewish Latin American Identity and Cultural Production" (edited by Monique Balbuena and Adriana Brodsky), Special Issue, Journal of Jewish Identities, 5:1. 1994, Poe e Rosa à Luz da Cabala (Rio de Janeiro: Imago). 2016, "Ladino in US Literature and Song," The Cambridge History of Jewish American Literature (edited by In Hana Wirth-Nesher), Cambridge University Press. 2014, "When the Eye Meets the World: Reading Subjectivity in Two Poems by Carlos Drummond de Andrade," Portuguese Literary & Cultural Studies, n.26: 127-141. 2012, "Judeo-Spanish Texts in Latin American Genres: Language Revival and National Identity in Contemporary Argentina," Selected Papers from the Fifteenth British Conference on Judeo-Spanish Studies (edited by Hilary Pomeroy, Christopher J. Pountain and Elena Romero), Queen Mary University of London. 2012, "Ladino in Latin America: An Old Language in the New World," Contemporary Sephardic Identity in the Americas: An Interdisciplinary Approach (edited by In Margalit Bejarano and Edna Aizenberg), Syracuse University Press. 2011, "Athens, Salonika & Israel in Margalit Matitiahu’s Poetry," Cadernos de Língua e Literatura Hebraica, n.9: 67-79.